Summer vacation has allowed the team members some time for tinkering. “Eureka!” shouts Harper. “Ever since that Old Coin Game a couple months ago, I have been working on my three-pan balance, and I have almost perfected it. You put objects in each of the three pans, and you can tell if they all weigh the same, or if two weigh the same and one is different — in which case you can tell which it is and whether it is lighter or heavier. Right now it produces unpredictable results when the three pans all hold different weights, but even so, I can detect a counterfeit among more coins in two weighings than you can in three weighings with a regular balance.” Recall, the setup is that you get a certain number of coins, including a specific one that’s guaranteed to be real. The set of coins may have one counterfeit coin, which could be either lighter or heavier. 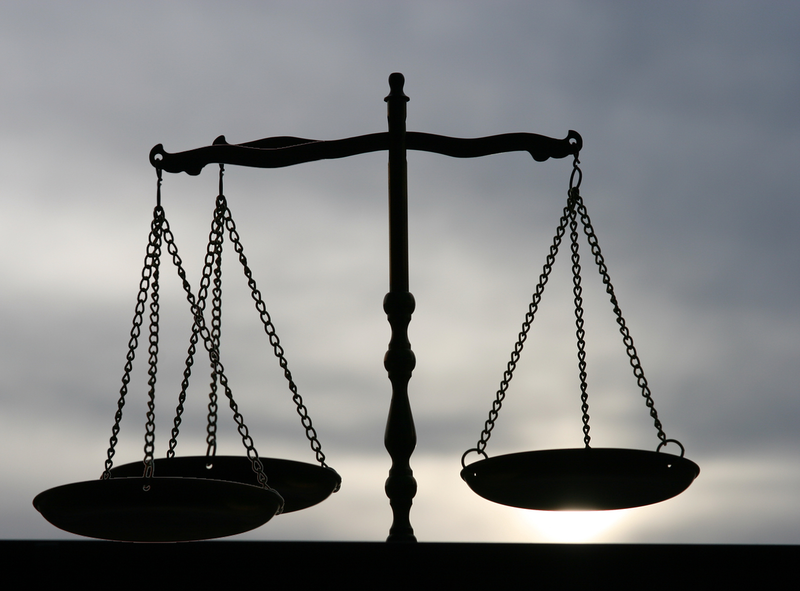 The goal is to determine if there is a counterfeit and if so, which one it is and whether it is lighter or heavier. What is the greatest number of coins among which Harper can always detect a counterfeit in just two weighings with the three-pan balance? In the sequence of events described, what is the probability that the urn from which you drew the balls is the one that started with two reds? Circular Triangle. Let x be the requested length of segment EF, as shown in the diagram. 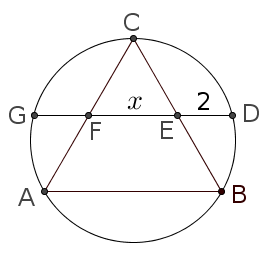 Since ABC is equilateral, in order for AE and BF to be the angle bisectors of angles A and B, points E and F must be the midpoints of their respective sides. Therefore, triangle CEF is an isosceles triangle with apex angle 60°, and so it is equilateral. Therefore, segments FC, CE, and EB all have length x. Also, by symmetry, segment FG has length two. But now the power of the point E in the circle is CE · EB = DE · EG, so x · x = 2(x + 2). Solving x² – 2x – 4 = 0 yields x = 1 ± √5. Since segment lengths must be positive, we conclude that the length of segment EF is 1 + √5. Spherical Cube. Let the point where the ray r from C to D crosses the sphere be called E, as shown in the diagram. The problem asks for length DE. First, let’s compute length CD. Projecting down onto the bottom face of the cube, we see that CD is just the hypotenuse of an isosceles right triangle with legs equal to 1/2, and hence it has length 1/√2. Now, to find the length DE, consider vertices F, G, and H of the cube as shown. Of course face diagonals FG, GH, and HF are equal. Also, C is the midpoint of HF and D is the midpoint of GH. 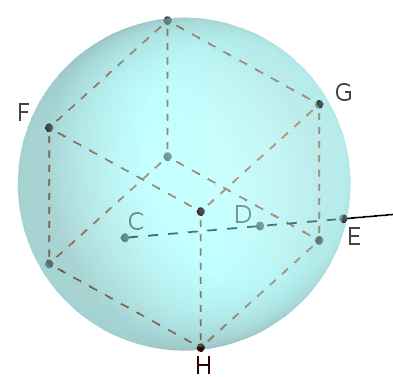 Consider the plane defined by points F, G, and H. That plane intersects the sphere in a circle (since all planes do), and certainly F, G, and H are on this circle. Since C and D are also in this plane, ray r is as well, and therefore E lies in this plane, on the circle containing F, G, and H. In other words, restricting ourselves to this plane, the diagram for this problem is identical to the previous one! (with F, G, and H playing the roles of A, B, and C, respectively.) Since in the previous problem, DE was 2/(1 + √5) as long as EF (the reciprocal of the golden ratio! ), we know that in this problem DE is 2/(1 + √5) · 1/√2 = √2 / (1 + √5). 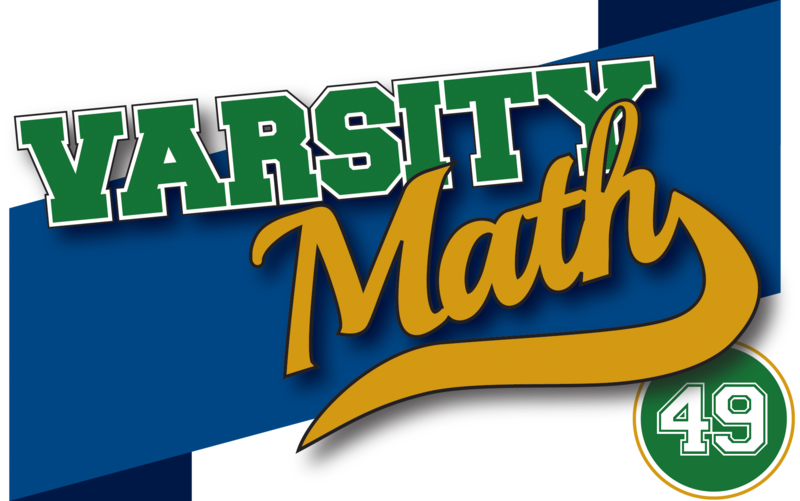 A good Varsity Math team member should always try to do the minimum work possible to reach the answer of a puzzle, and this last problem takes the cake on conserving effort. You don’t need to do any work at all if you just keep your eyes sharp to realize that it’s just the same as the previous problem, in three-dimensional clothing. Plus, that golden ratio showing up means you’re probably on the right track; the golden ratio comes up all over mathematics and problem writers just seem to love it.